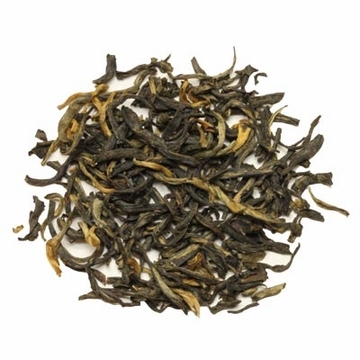 This distinctive superior black tea comes from the Yunnan province. 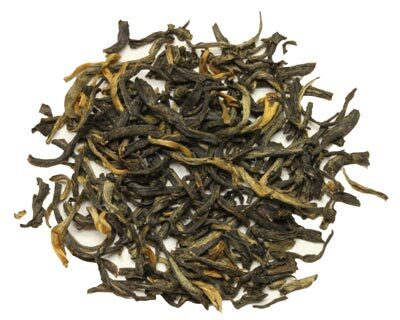 Yunnan Black was first produced over 1500 years ago, making it one of the oldest teas. This strong tea has a spicy aroma and yields an orange-reddish cup. Yunnan is good after dinner and can also be enjoyed with milk. There really is something very more-ish about this subtle honey-nuanced tea. I think it's because it seems like an ordinary China black tea, yet the subtle flavours become something you just want to have every day! A wonderful tea - thank you! I am so loving this tea. I bought the sampler pack of tea and after tasting the teas I ordered 4ozs of this tea. I actually drank two cups if it yesterday evening (normally I only drink one cup of tea in the evening). I stopped buying Yunnan teas here because a batch 3 years ago was not good. Now it's going back to its quality. The tea is well balanced, smells and tastes as real Yunnan tea. Recommended. Seems to be similar to commercial tea. This is my favorite. The taste and the mood it puts me in is the best. This is my cash cow favorite and I will always enjoy this once a day along with other tea. It has a great taste: not to harsh or to oolongie/green mild, but just right. The tea is good, refreshing, tasty. Not as good as Yunnan can be, but definitely better than that sold here 4 years ago. It is improving. Love this tea. Yunnan is the only tea I've found that I can brew as strong as I like and is not bitter. I make 7 - 12oz. cups on Sunday and and heat a cup in the microwave every morning. Doesn't get and easier than that. This is a superb tea--it's smooth, has wonderful flavor and a very nice after-taste. It needs neither milk nor sweetener to be completely satisfying. Highly recommended. Bold flavor and a very good energizer when a spark is needed or just simply to relax and enjoy a quality cup. I stumbled on this tea a number of years ago, and I keep coming back to it. It is rich, robust, a little earthy, and very smooth. It is a "filling" tea, if that makes sense! Very satisfying. This is high quality tea at a reasonable price. Definitely my "go to" when buying loose leaf tea. I've been drinking this tea for years. Enjoying Tea: good tea, good service. This stuff is great. It reminds me a lot of the "Golden Monkey" that a lot of sites (besides enjoyingtea =/ ) sell. However, it's about half the price, so you really can't go wrong. Easy ordering, fast delivery and really good tasting tea. I love this tea. It's absolutely my favorite go-to black tea and I normally buy it by the pound. It's perfect when you want something without any frills or fuss, just a rich, lovely black tea. Excellent by itself or with milk and sweetener. Thanks for the great tea ... and the great price. If you are a black tea fan you will find this to be delightful year in and year out. I am really enjoying this tea. It has very nice flavor. I've been drinking Yunnan Black for quite a while. It never disappoints and neither does Enjoying Tea. I might be partial in my opinion because this tea happens to be one of my family's favorites and I grew up drinking it. It's been a while since I've had it though and I still enjoyed it a lot. There's a lot you can do with it as well. It tastes great sweet, plain, hot, iced, with lemon and honey (great for colds), and with spices. My personal favorite I came up with 15 years ago (as a kid) is a mix of a brown rock sugar, 2 cloves per cup, 1 cardamon grain, and a hint of dry ginger. It's my ultimate winter treat. Enjoy ! Excellent tea, I've shared a cup with several of my friends and they have all commented on how good this tea is. The internet service provide from Enjoyingtea is also great with no problems with orders and fast delivery. If you know someone who likes a good tea Yunnan Black Tea would be great as a Christmas gift. This is my favorite black tea hands down. Very deep flavor with a nice rich after taste. I go to this when I can't make up my mind which of my teas to have. Strongly recommend this tea to the experienced tea drinker or someone just trying tea for the first time. You cannot go wrong. If you are looking for a black tea that's a bit different try this one! I've been enjoying this tea for years. it's great any time of day. I read good things about this tea, so I purchased some. Following regular steeping instructions the flavor is a bit tannic for my tastes. This may be because I typically drink green tea though. The flavor of the tea isn't bad though, and I will try to steep this tea at lower temperatures to see if I can cut the bitterness. I typically drink this with my dinner or during the daytime. I was going to try the Yunnan gold instead but it was out of stock. I'm glad I did try this because it's become my favorite black tea. Deep but delicate flavor notes, rich flavors but very mild not overpowering. One to always keep in your drawer. Great for morning caffeine fix...honey makes it super addicting. This is my 'everyday' tea. Always good, always flavorful and satisfying. Filled with energy, this tea will not disappoint! This is really great tea! I have to say the Imperial Golden is quite a bit tastier, but that doesn't detract from the great flavor of this one. It's a good tea to enjoy when you don't have a more specific flavor in mind.